According to Bronfenbrenner’s ecological model there are five environmental systems in which a person lives and develops. They are the microsystem, mesosystem, exosystem, macrosystem and choronosystem. The microsystem is the setting in which an individual lives and develops, or immediate environment (Bryant, 2001). 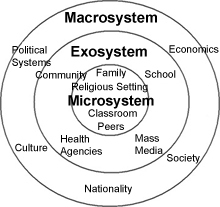 Examples of a microsystem would be the family, school, or peer group. Microsystems do interact with each other and influence each other, and this point of interaction is called the mesosystem. The family is seen as a microsystem and is the main influence on development of a child. Bryant and Bryant (2001) discuss that this system is not limited to human interaction and that television and the internet are now a part of this influence on child development within the microsystem of the family. I chose this trailer for Little Miss Sunshine to illustrate a microsystem because the movie focuses on the interactions of the family members, and along the way, there are several interactions with other microsystems such as the pageant. There are also to children at different levels of development within this microsystem. Olive is a young child growing up in this certain microsystem. What are the implications for thinking systemically about child development? Do certain models of therapy lend themselves to conceptualizing these different systems? Bryant, J., & Bryant, J. A. (Eds.) (2001), Television and the American family (2nd ed.). Mahwah, NJ: Lawrence Erlbaum. Most models of therapy we’ve been learning about so far deal exclusively with the microsystem (read, family). This is fitting since after all, they are models of family therapy. Structural and Strategic therapies specifically come to mind. However, with the recent reading of Nichols and Schwartz’s IFS models, we are called back to being mindful of the individual (what would be a word for “smaller-than-micro system?). They are right to point out that this sub-microsystem must change if systemic interactions have any chance of changing. On the other hand, what about systemic change on the exo- and macrosystemic levels? Obviously systemic principles can be seen to be at work here with dysfunctional societal conditions filtering down to produce dysfunctional families. A change of this nature could possibly be characterized as third order change. As was pointed out early on, the higher the order of change sought, the harder it is to achieve. Should high difficulty be enough of a deterrent for us to focus our energy only on micro-or-lower systems? Should societal change be left to the arena of political policy makers bent on taking whatever stance is necessary to maintain political stature? Are there any organizations already in place driven by pro-family agendas uncompromised to left- or right-wing politcal leanings? Well I agree with Scott that the models of therapy that we have been learning these past few months have centered on microsystem changing, and below. It seems that most of the focus has been on the microsystem and the individual because that is the area that is most relevant to a specific person and most able to “quickly” change when compared to the other systems in Bronfenbrenner’s model. The higher you go up on the model, it seems the more resistant to change the systems are. Also the higher you go up in the model, the less influence there is on the individual. In creating change with an individual, the most power seems to lie with the individual, and then bringing in the microsystem such as the family. The other realms can be changed, but there seems to be more difficulty for a therapist to change these arenas. One thing I did notice was the integration that Schwartz brought in to the discussion by applying his IFS model not simply to individuals or even families, but he did seem to consider the societal and cultural levels that we interact with on a daily basis. I appreciated this because it does seem that most of the other models we have looked at follow the systemic model, but relinquish control outside of the microsystem.